pledges "new era of openness in our country"
"President Obama swiftly sets course on Day One"
"Obama overturns Bush order on access to White House records"
"Advocates praise Obama move on gov't disclosure"
"Obama limits ex-presidents' discretion on records"
The FOIA Memorandum articulates a presumption of disclosure for government records and a hostility to the use of secrecy laws to cover up embarrassing information. It directs the Attorney General to issue new guidelines governing FOIA and the Director of the Office of Management and Budget to improve information dissemination to the public. President Obama also issued an executive order reversing changes made by President George W. Bush to the Presidential Records Act (PRA), stating he would hold himself and his own records "to a new standard of openness." The PRA order permits only the incumbent president (and not former presidents' heirs or designees or former vice presidents) to assert constitutional privileges to withhold information, and would provide for review by the Attorney General and the White House Counsel before a president could claim privilege over his or her records. 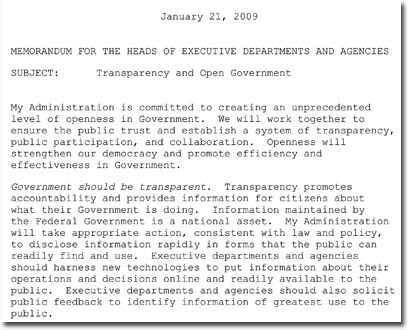 Finally, President Obama also today issued a Presidential Memorandum on Transparency and Open Government which recognizes that "[o]penness will strengthen our democracy and promote efficiency and effectiveness in Government." It directs the Director of the Office of Management and Budget, the Chief Technology Officer, and the Administrator of the General Services Administration to develop an Open Government Directive within 120 days to implement the memo. In November 2008, the National Security Archive and a coalition of more than 60 organizations called on President Obama to reverse the secrecy trend and issue new directives on openness on Day One of his presidency. Today, President Obama heeded that call and took decisive action to ensure that openness, transparency, and accountability would be the rules and not the exceptions for his administration.